Technical Pro’s microphones translate voice and instrument recordings so good you won’t even know it’s a recording after you play it back! Their microphones are durable and strong and can be used in some of today’s most demanding recording environments. Technical Pro is now offering that same innovative technology and rugged design in their series of wireless microphones. 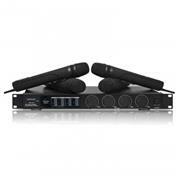 The WM1401 is a Professional Quad Signal VHF High Band Wireless Microphone System with four microphones included. The WM1401 is a rack mountable wireless system that can be connected up to a rack or just set up on a flat surface. The system runs a Quad VHF high band that comes complete with four microphones. This is a professional frequency system that is found in the same wireless systems that you see on TV and at live concerts! The hand held microphones are extremely sturdy and made to be picked up and placed down depending on your needs and performance. The sleek black design and high quality parts will give you the assurance you need that your microphone will consistently perform at a professional level and impress any client or audience. This set up is perfect for any type of live situation DJs or live performances, large conference rooms or halls, auditorium or gyms, live on stage the uses are endless! And without the worry of messy cables you can take these microphones virtually anywhere without getting tripped up! The microphones are Uni-Directional. This is a very important aspect and will allow you to use this microphone is noisy or loud ambient environments without worrying about picking up room noise or distortion that will interrupt your recording or broadcast. This means that the person coughing in the back of the room will not transmit through the microphone! This means that you can DJ your music and still talk over it without multiplying sound signals upon themselves! No worries here! The WM1401 is a perfect wireless system for conference meetings, showrooms, DJ’s, live stage settings and even in the studio. If you are showcasing a product or making an announcement to a large audience, the benefits of walking around without the worry of messy wires is priceless! If you are a DJ, no need to worry about crossing microphone cables walk freely with mic in hand and impress your crowd too by showing them you are a professional using professional gear. At a price that can’t be beat, the WM1401 is one of the best choices on the market for a wireless microphone system! And if you need additional options with your wireless microphone system be sure to check out the other wireless microphone products from Technical Pro!